[S25] Census-US federal-1900, (Ancestry.com. 1900 U.S. Federal Census [database on-line]. Provo, UT: MyFamily.com, Inc., 2004. T623, 1854 rolls. ), New Orleans, Ward 5, Orleans, Louisiana; Roll: T623 572; Page: 9B; ED 50 (Reliability: 2). [S18] US-Louisiana-Orleans Parish-New Orleans Birth Records Index 1790-1899, (Ancestry.com Provo, UT, USA: The Generations Network, Inc., 2002. Original data: State of Louisiana, Secretary of State, Division of Archives, Records Management, and History. Vital Records Indices. Baton Rouge, LA. ), Vol 105, Page 91 (Reliability: 1). [S27] Census-US federal-1910 (ancestry), National Archives and Records Administration, (Ancestry.com [database and images on line]), Louisiana, Orleans, New Orleans; T624_521; Part 3; page 212B (Reliability: 2). [S31] Social Security Death Index (ancestry.com), (Provo, UT, USA. Ancestry.com. Original data: Social Security Administration. Social Security Death Index, Master File. Social Security Administration. ), Dillenkoffer, Henrietta (Reliability: 1). 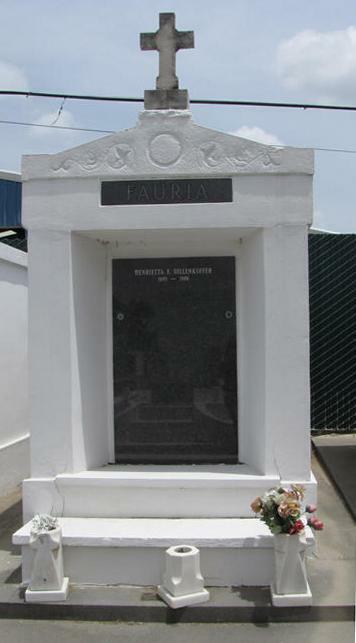 [S334] US-Louisiana-Orleans Parish-New Orleans-St. Louis Cemetery #3 Fauria Tomb ownership records, Saint Louis #3, Fauria, Henrietta. Burial 12 Jun 1986, Position V2. (Reliability: 3).